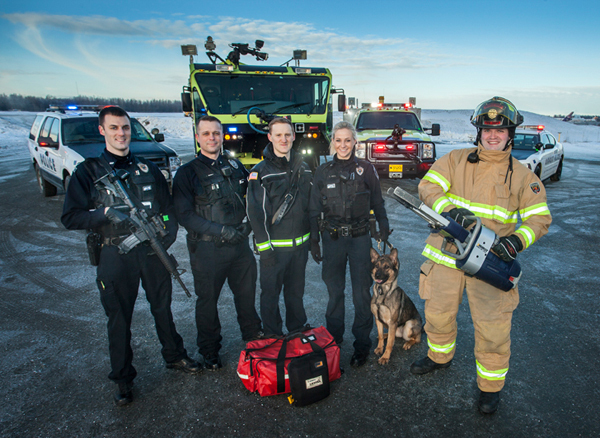 The mission of the Ted Stevens Anchorage International Airport Police and Fire Department is to protect Life and property by providing professional police, firefighting, and emergency medical services. We Dedicate ourselves to the Alaskan community through Honor, Courage, and Integrity. The Airport Police and Fire Department is responsible for ensuring around-the-clock police, fire, and first responder emergency medical services at Ted Stevens Anchorage International Airport and its surrounding property, such as Lake Hood and Kulis Business Park. The Airport Police and Fire Department protects over 10,000 employees and over 5,000 acres of land at Ted Stevens Anchorage International Airport. The Airport Police and Fire Department employs over sixty people, including certified officers and administrative staff, and Emergency Services Dispatchers. Certified officers of the Airport Police and Fire Department practice unique public safety procedures, with each officer trained to perform the duties of police, fire, and first responder emergency medical service. Officers are prepared to take on all these responsibilities depending on the situation. On behalf of the Anchorage Airport Police and Fire Department, I welcome you to our web page. I am proud to lead the men and women of the largest Airport Fire Department and the 3rd largest police department in the state of Alaska. The uniqueness of our mission as dual-certified police and fire officers demands highly dedicated and highly trained employees, and we stand ready to answer that call on a daily basis. We are fortunate to attract the highest caliber of men and women capable of delivering outstanding police, fire, medical, and rescue services. The cornerstone of our mission is customer service. We are dedicated to constant quality improvements to provide the best service and the safest community for all airport employees, tenants, visitors, and the traveling public. We remain committed to your safety and security by working cooperatively with other airport, municipal, state, and federal agencies. I personally welcome your comments and suggestions.